The rising prevalence of cardiac disorders all over the world has boosted the market for cardiac surgery instruments in present day. Cardiac surgery instruments market is also drawing benefits from cross-channel demand in order to improve medical care and services. These services are inclusive of patient safety, along with proper care both before and after the surgery, nursing of wounds and others, thus, empowering a steady and smooth growth of the sector. Government is also supporting growth of the medical device market and healthcare sector completely. This is also among one of the factors to boost the growth of the cardiac surgery instruments market in the long run. Changing lifestyle of people and their eating habits have led to the emergence of a lot of medical conditions. The most common of them being obesity and cardiac problems. The increasing popularity of cardiac disorders like coronary artery diseases, cardiomyopathies, cardiac arrest, and others especially in the developing economies like China, Japan, and India have led to the growth of the cardiac surgery instruments market. Heart problems also results in death at times, because of which it is necessary to treat them with surgery as soon as possible. This awareness has also boosted the market for cardiac surgery instruments in the past few years because of the fear of death. Thus, the future market is expected to generate more revenue because of the surging awareness about the harmful and fatal results of cardiac problems and the importance of surgery in order to look for a cure. The global cardiac surgery instruments market is presumed to grow at a strong CAGR of 6.3% by the end of 2022. The forecast period is set from 2017 to 2022 and the segment market share is envisaged to accelerate to 30.3% in 2022 from 29.6% in 2017. The global cardiac surgery instruments market is segmented on the basis of product, and end user. As per the segmentation by end user, the market is categorized into Hospitals, cardiology clinics, and ASCs. As per segmentation by product, the market is classified into clamp, scissors, needle holders, grasping forceps, and vascular forceps. Among these, the segment with vascular forceps is expected to dominate the market because of its various uses in cardiac procedures. It is also among the most important instruments in any surgery and thus, vascular forceps are likely to continue dominating the market segmentation in the future as well. As per geographical segmentation is concerned, the global cardiac surgery instruments market is divided into the regions of North America, Europe, Latin America, Middle East and Africa and Asia Pacific. Among these, the North American and European market is seen to be holding a dominant share in the worldwide market because of the lifestyle and untimed food habits, resulting in more diseases and cardiac problems, ultimately leading to cardiac surgeries. Apart from that, because of the quickly developing healthcare industries and medical sectors in the western economies, the market for cardiac surgical instruments is expected to see rise in the future years. On the other hand, Middle East and Africa is also seen as a future prospect in terms of growth and development because of the emergence of new and better healthcare sector and surging awareness in terms of healthcare and hygiene. The expected valuation of cardiac surgery in the Middle East and African region is prognosticated to reach US$53.4 mn by the end of 2022 with a steady CAGR of 5.4%. Prominent players in the global cardiac surgery instruments market are Delacroix-Chevalier, Cardinal Health Inc., CONMED Corporation, Dickinson and Company, Medline Industries Inc., and Cardivon Surgical Inc. The global cardiac surgery instruments market report provides readers with a complete analysis of the global market through detailed assessment of the segmentation of the cardiac surgery instruments market and the market’s competitive dynamics. The global cardiac surgery instruments market has experienced steady growth in the recent past due to the growing prevalence of cardiac diseases in a number of countries across the world, making the market relevant to the healthcare sector in terms of its commercial contribution and technological scenario. The report provides a thorough assessment of the global cardiac surgery instruments market aimed at guiding readers towards profitable strategies in the market. 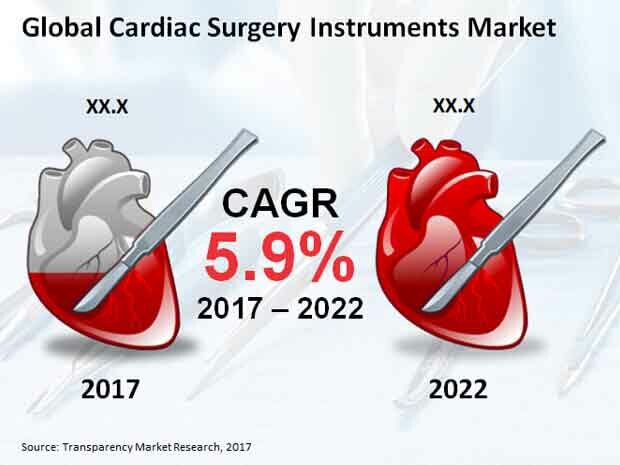 According to Transparency Market Research, the global cardiac surgery instruments market was valued at US$1,061.4 mn in 2017. Exhibiting a steady 5.9% CAGR, the cardiac surgery instruments market is expected to rise to US$1,412.7 mn by 2022. The major drivers and restraints affecting the global cardiac surgery instruments market are profiled in the report in order to deliver a clear picture of which factors are likely to leave a lasting impact on the market in the coming years. The growth trajectory of the cardiac surgery instruments market is affected by a number of factors due to the close association of the cardiac healthcare sector with healthcare safety and product quality regulations. The regulatory factors affecting the global cardiac surgery instruments market are thus described in brief in the report, aiding readers in understanding the regulatory landscape likely to determine the growth prospects of the cardiac surgery instruments market in the coming years. The detailed assessment provided in the report will help readers navigate the various pitfalls in the cardiac surgery instruments market, as the market carries a certain amount of risk due to strict healthcare regulations. The product and end use segments of the global cardiac surgery instruments market are studied in the report to deliver readers a clear picture of the hierarchy of the market by each criterion. The leading segments in the cardiac surgery instruments market are profiled in the report and their historical figures are assessed in detail to understand how the segments are likely to develop over the coming years. The report segments the global cardiac surgery instruments market into vascular forceps, grasping forceps, needle holders, scissors, clamps, and other instruments, and delivers 2012-2022 timelines for each product segment. Vascular forceps are likely to remain the dominant revenue generator for the global cardiac surgery instruments market in the coming years due to their widespread demand. The vascular forceps segment is expected to exhibit a strong 6.3% CAGR over the 2017-2022 forecast period to rise from US$314.6 mn to US$427.9 mn by 2022. Geographically, North America is expected to hold on to a dominating position in the global cardiac surgery instruments market in the coming years by exhibiting a 6.2% CAGR from 2017 to 2022. The North America market is likely to rise to US$503.1 mn by 2022, followed by Europe, which is expected to reach a valuation of US$429.9 mn by 2022. The report provides an accurate picture of the competitive landscape of the global cardiac surgery instruments by profiling each leading company and describing its role in the development of the cardiac surgery instruments in recent years. Leading cardiac surgery instruments market players assessed in the report include Cardivon Surgical Inc., Medline Industries Inc., Delacroix-Chevalier, Cardinal Health Inc., Becton, Dickinson, and Company, CONMED Corporation, Teleflex Incorporated, C.R. Bard Inc., and B. Braun Melsungen AG.